I think it fair to say that we were all nervous about the game as we approached kick-off. Saints had now dropped well into the drop zone, with only West Brom below us in the table, following Swansea's win the night before. Things didn't look good. In the past few games, more often than not, Saints have been good in the first half, but appalling after the break. This time, just to mix it up a bit they were simply dreadful in the first half, but much improved after half-time. The team looked distressingly familiar, with a back five of McCarthy, Cédric (carrying an injury), Stephens, Hoedt and Bertrand (also carrying an injury). The midfield was Romeu, Højbjerg and Davis, with Ward-Prowse and Tadić wide and Long alone upfront. The bench included the new signing, Guido Carrillo, Yoshida, Boufal, Lemina, Gabbiadini, Pied and Forster. So, the majority of our attacking strength and guile was actually on the bench. And the two starting full backs were both injured. For the most important game of the season so far. Stunning. From the start, two things were immediately apparent. Firstly, Brighton were very poor, just as well there wasn't much threat from them, with Bertrand managing little more than walking pace. Cédric looked slightly better, but only in comparison to Bertrand. The second thing was clear, the manager had got it painfully wrong again. Tadić and Ward-Prowse were putting plenty of crosses into the box, which Pellè, or Rickie Lambert would have lapped up, but Long was being out-jumped every time. Saints managed a couple of corners, but amazingly the majority of the team stayed back and the ball was fired into the box for two Saints players up against eight Brighton players. Didn't we want to score?? Consequently there was a certain air if inevitability about the penalty. Brighton broke away from their half and there was a general mêlée in and around Saints penalty area. Nobody was surprised when the ref. (Mike Dean) suddenly pointed to the spot. None of the Saints players seemed to protest initially, although they soon surrounded Mr. Dean. Pointless really. Murray stepped up and sent McCarthy the wrong way. Fourteen minutes gone and a score of 0-1. It was not going well. The rest of the first half was just a blur to me. Gutted does just not cover how I was feeling. Saints looked more and more clueless, the goal had taken the stuffing out of them. Thankfully we reached the break without them conceding again, which was as much down to Brighton's incompetence as anything. The first to appear after the break was actually Mike Dean and his team, then Brighton appeared. Finally Saints appeared. Stone me, Mauricio Pellegrino had actually changed things! Carrillo was on for Tadić and Boufal was on for Romeu. Straight away Saints looked a different proposition and Carrillo looked good, although clearly not match fit yet, he was causing Brighton all sorts of problems. The main problem following the switches was not obvious at first. We had brought on a 6' 2" striker who was capable of challenging in the box and guess what? We stopped sending in crosses. Brilliant. A master tactician our manager. Sadly this was as good as it got. Without the service, Carrillo was dropping deeper and deeper, just to get the ball. 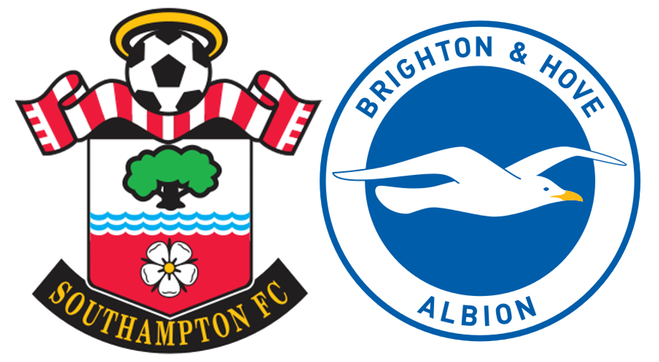 The game fizzled out without much to get excited about and two points were dropped, which would have seen Saints climb several places out of the drop zone. As it was the club is still in the mire, albeit above Swansea again, but only on goal difference. Another statistic worth mentioning is that Saints have hit the crossbar and uprights more than any other club this season. In fact Højbjerg hit a thunderous shot which rebounded off the crossbar in this match. Just inches between 3 points and 1. None of that papers over the fact that Pellegrino got it tactically wrong yet again. At least he realised this time, but he must be running out of chances to save his job. Lose to West Brom and that will surely be curtains for him. 2017-18 Index Enter description here. Signings Index Enter description here. PL Match Reports - Home Enter description here. PL Match Reports - Away Enter description here. Rickie Lambert Tribute Enter description here.